This design will make your excitement go straight to the moon and back! 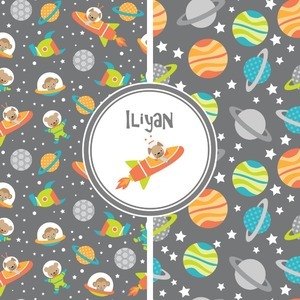 This is such a fun design for anyone who loves space and adorable critters! The design is filled with adorable little animal friends in space suits and space ships! On the other side, there are cute little coordinating planets! The bright colors on the animals and planets make for a great contrast to the dark grey background. There are bright greens, yellows, blues and oranges! So many fun colors! You can even use some of the little space animals as larger graphic elements. Don't forget to personalize your design by changing the text, colors, layout, graphics, and more!